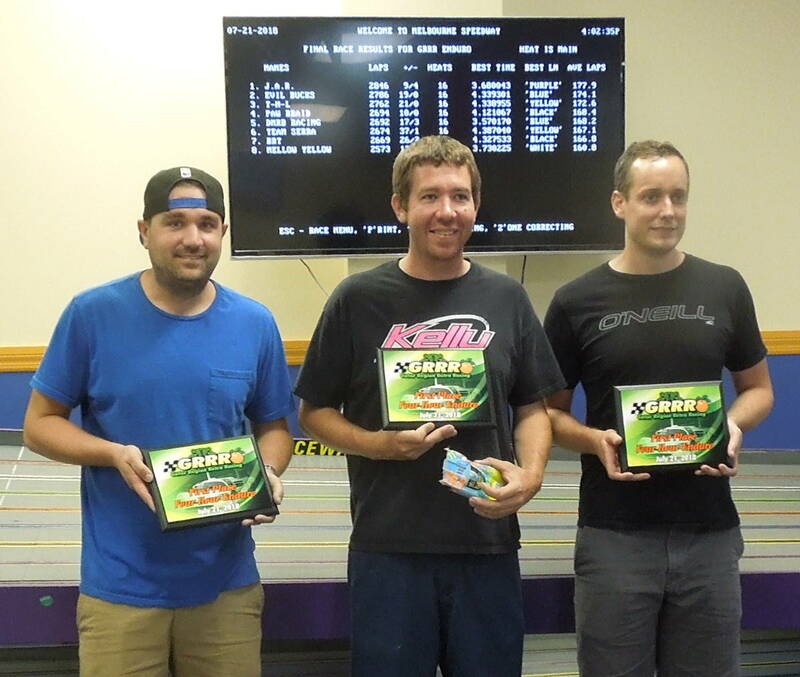 This event was held at Bill Pinch's Raceway.biz facility in Melbourne, FL, on July 21. Let's start with the pre-race celebration - Terry Tawney's 70th birthday! 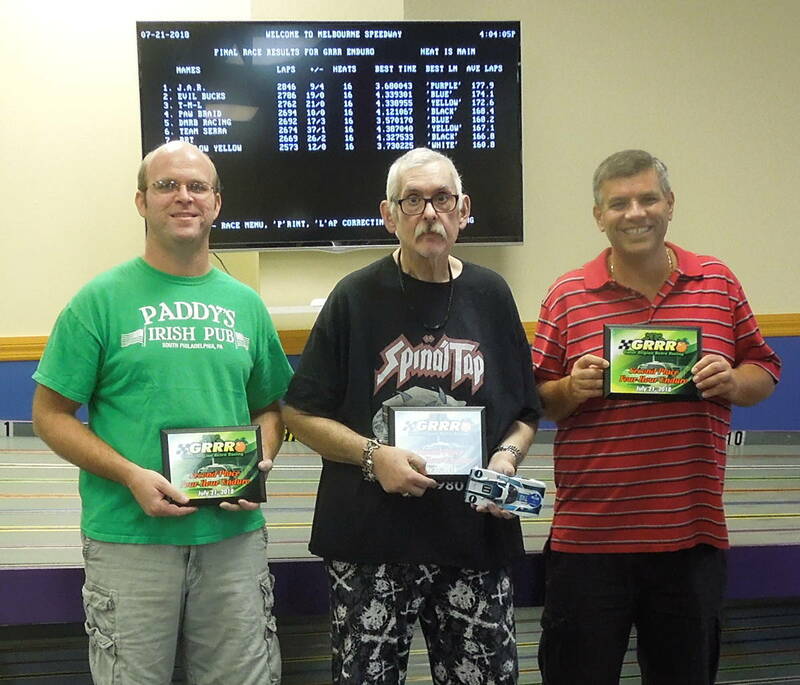 If there's a nicer guy in all of slot racing, I don't know who it would be. The GRRR guys brought him a great chocolate cake and here Terry is cutting the first piece. Terry and I were talking to try to figure out when we first raced against each other and our best guess is early '90s, maybe around 1993 or so. That's 25 years! There was another racer who was scheduled to run as a member of Team DMRB but he had a last-minute conflict and was unable to make it; Ralph Josey took his place. Bob Rondinone was race director for most of the enduro but wanted to run a heat, so Team DMRB accommodated his wishes and trackowner Bill Pinch rode the spacebar when Bob raced. 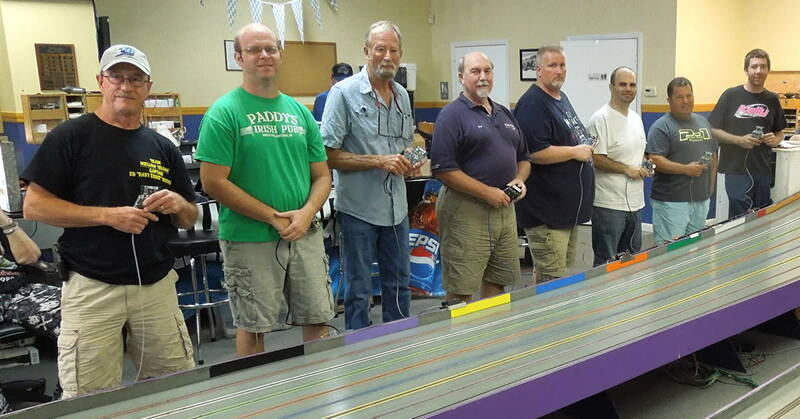 Nice to see two other raceway owners running in the GRR 4-hour enduro: Ed Hoffman, who runs Fast Eddie's Slot Cars & Raceway in Pinellas Park, FL, and Marcus Ramos, owner of P1 Lot Car Raceway in Winter Garden, FL. No one ever qualifies for enduros and that was the case here. Lane choice was made somehow, probably by draw, but I wasn't paying attention so I am not sure. 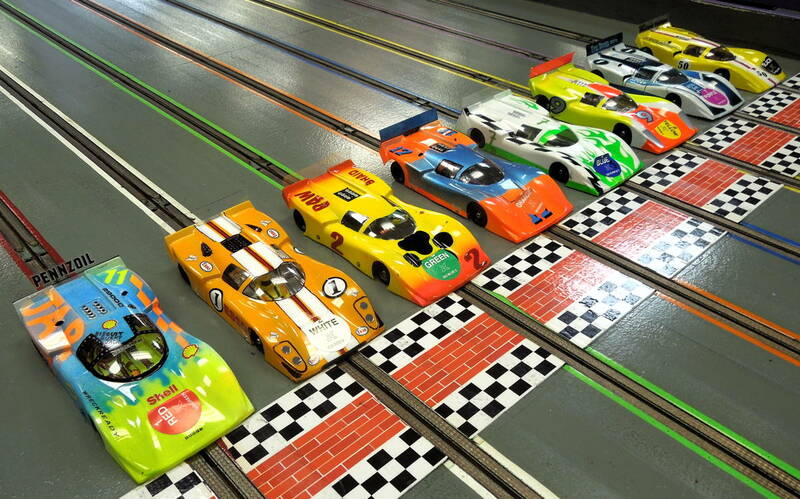 Here's how the racers lined up for the first of sixteen(!) 15-minute stints. L-R, Ed Hoffman, Grant Goerner, Terry Tawney, Jay Guard, Brian Ambrose, Jeff Bonnano, Marcus Ramos, Mike 'Biscuit' Bresett. Trackowner Bill Pinch was tapped to vote concours and the cars' positions below indicate his first through third choices. Bill then did something I've never heard in all my years of watching concours be selected: he explained his criteria for making his choices. Not listing the normal 'best lap time in which lane' info, as there were a number of best lap times that were clearly riders, of which there were quite a few during this long race. Grant Goerner, GRRR race reporter extraordinaire, emailed me a PDF of the heat-by-heat printouts from the SRT lap counting system and it is attached to the bottom of this thread, if anyone is crazy enough to want to see how the enduro progressed in detail. I am not aware of anyone 'blowing' one of the Hawk Retros. Team SERRA changed a motor because it had slowed a bit after a couple-three heats, but the number of walls it had experienced by that time may have had something to do with the situation. I did hear one racer warning a teammate that their motor's brakes had dropped off in one particular lane, but that was about it. My digicam's battery went south on me before I could get all the podium shots I had hoped to take. There were others present who took the pics I missed and if they can email those to me, I'll add them to this thread. 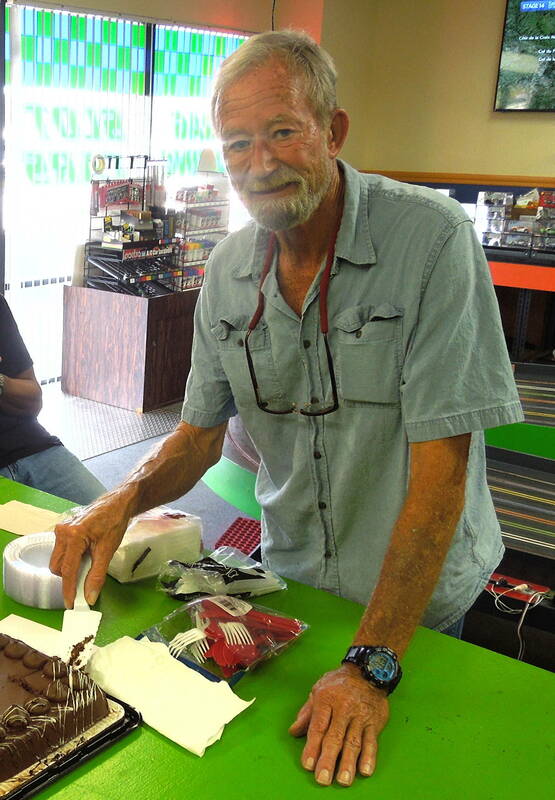 A word about Bill Pinch, who has been a raceway owner for over 35 years. 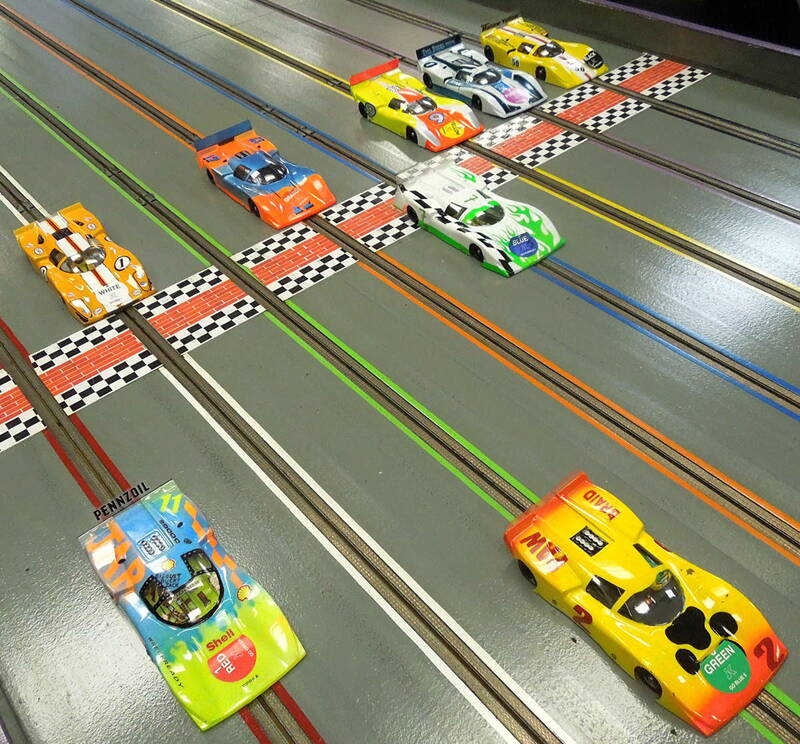 I'd term his operation the prototype or poster child for a sustainable slot car raceway operated by a someone who clearly knows how to run a business. If you're in the area, don't miss paying Raceway.biz a visit. Thanks for the report, Greg! Big thanks to Doc Dougherty for all the hard work he put in organizing this event. For more photos of cars, people, and the event please visit this LINK. Greg, great report. And thank you for coming down to Florida and racing with us. In fact, our team changed motors during the 10th heat when I was running on red. On both motors, especially the second one, the motor brushes are gone. I am surprised that any team was able to run the entire race on one motor, but apparently, about five teams did just that. We ran one motor. There is about 20 percent left on each side. Ran ice cold the whole race. Just lost a little brakes the last couple of heats. Sounds like the 1st GRRR endure was a great race !!! !Nice to hear my old racing partner Bob Rondinone was able to enjoy some retro racing .